I love the days that are both relaxing and productive. After 8 hours of blissful sleep I got up to start the day. Pricer made me breakfast since I was whining about not having bread for toast. We head off to Home Depot for our Christmas tree. 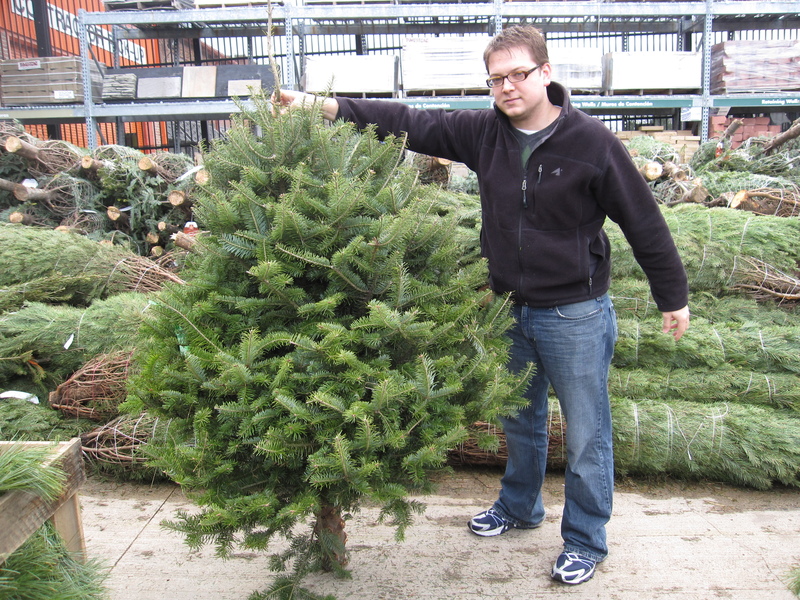 We got a 5-6′ balsum fir. Much smaller than last year but just as nice. It already makes the apartment smell good. Then I worked on a paper- last paper!!!! and headed off for lunch. We went to Regal Beagle. A cute place- amazing felted wallpaper- with good food but I suggest that folks go at night if you don’t want to hear kids yelling and their parents begging them to sit, eat, turn around, etc. When did kids become dogs?!?!? Then off to CVS to develope pictures- fail. After selecting my pictures, editing, and resizing them the machine crashed and I lost my patience. But the afternoon is still saved since we went to Gap and I bought this amazing hat!!! I wore it around the store and embarrassed Price. More homework, dinner, and now Pineapple Express while doing more homework. i totally love your hat! I also love the Gleelster word! I’m gonna remeber that one. I just got a glee t-shirt and am going to scrap about my obsession!